For several years I had participated in the Mental Illness Reading Challenge at Opinions of a Wolf, but that one was deleted before this year began. I could not find a similar reading challenge for 2018, so I kept tract of mental illness reads as part of this one. 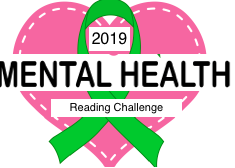 I then decided to create a Mental Health Reading Challenge myself for 2019. It's a topic close to me, so I like to read about it. Any book depicting mental health counts, whether fiction or non-fiction. Challenge takes place form January 1 to December 31, 2019. All books must be read during that time to count. All book formats (print, audio, e-books) are accepted. No levels, read as many books as you like. Need ideas for books? Check this Goodreads page for several lists of books on the topic. You do not need a blog to participate. You may sign up on Goodreads, YouTube, Twitter, Facebook, etc. Sign up below and leave a comment. Thanks for doing this! This topic is near to my heart as well, and at the very least I read nonfiction books on the subject every year. Currently a MFT student and I would love to expand my mental health reading list outside of my textbooks. does the whole book have to be read within 2019? i'm a very slow reader and i generally read in languages other than English or Russian (my native language), and I have lots of unfinished books :/ I read pretty much nothing in 2017-2018.